Foundation Inspections recognize the flaws of imperfect construction, the pressure of the earth, settling and uneven soils, and the house's weight bearing down on it, your home's foundation takes it from all sides. And when foundations fatigue and fail, the problems that appear can be anywhere from cosmetic to devastating to the home. Once a problem occurs, it will only continue to worsen as the home ages and the problem that caused the foundation failure continues. Foundation Supportworks is dedicated to recognizing these foundation problems in houses and addressing them with long-lasting solutions. Many homeowners assume that if a house is new, then the foundation must be strong. Unfortunately, this is a very common misconception. No matter how old or young a home is, cracks, foundation sagging, and other foundation problems are still possible. Every crack and sag in a home is a separate problem that could potentially worsen or be compromising the structural integrity of your home. If the pressure that created these cracks is not addressed, then the strain will continue on an already weakened structure. Very often, foundation wall cracks are not detected until long after they've formed. However, these cracks are often still very distressing, causing homeowners to believe that this crack appeared suddenly. 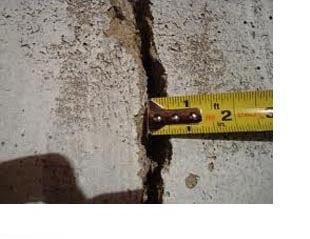 While this is usually not the case, it's certainly important to treat all foundation wall cracks as a potentially serious problem that should be assessed by a professional foundation engineer or specialist. Cracks in the foundation walls will most often appear at the weakest points, including corners, edges of basement window frames, holes for service, concrete cold joints, long spans of wall, pipe penetrations, and along the tie rods in the foundation. Any cracks detected should be checked on regularly – if you suspect that the crack has moved, spread, or widened, then your basement walls may be experiencing increased fatigue which will increase the damage and deepen the problem. Keep an eye on the crack by monitoring its length. Mark the ends of the crack with a pencil, and draw several "alignment" marks along the crack to check that the edges of the crack are not shifting unevenly. Date all marks to help record the rate of deterioration. ProChek Home Inspections, LLC offers all written estimates and consultations at no cost or obligation to you, do not hesitate to call for a free estimate today!